I have mentioned before my dear friend B (that stands for Bench) but I thought that today might be the perfect day to share with you why B in fact stands for Bench. You see, that's how we met. We were in a play when we were in high school. We went to different schools but knew each other through our church. Where we practically lived during our high school years. From Sunday School to numerous choirs to Habitat to our spring Broadway-style plays to a zillion other activities. We were there a lot. Anyway, it was play season. And we both had crappy "cast member" roles. It was Annie Get Your Gun- the world's most boring show by the way! So B and I were of course in the background of many scenes. And spent like half the play standing on either side of this bench. Our big gig was moving said bench from one side of the stage to the other. And eventually back again I believe. It's a wonder we are not on Broadway with our super-star skills, B! I mean, seriously. That should go on the resume. Bench moving. B and I actually took to calling ourselves "bench movers" for a long long time. We still bring it up. Yes, we both earned better roles (hard to believe one could get better than a bench mover, but trust me it is possible!) in the years to come but this was how we met. And became the best of friends. It was me, B and a bench. Three cheers to getting a loser nothing role in a high school church musical! So that was ....I don't know....let me think....1995 maybe? A long time ago for sure! And we are still fabulous friends. She has the most amazing fashion sense and a fantastic figure to boot. She is scared of the kitchen but is lucky enough to have a hubby who is awesome in the kitchen so it all works out. She's a great puppy momma to her Black Lab Dixie and an even more amazing friend. As further proof her her amazingness as a friend... look at what arrived today! I had this bag in my hand two times on Sunday. But I didn't buy it. For who knows what reason because I woke up yesterday missing the bag. Wishing I owned it. But drats, I am giving up shopping for non-essential items for Lent. 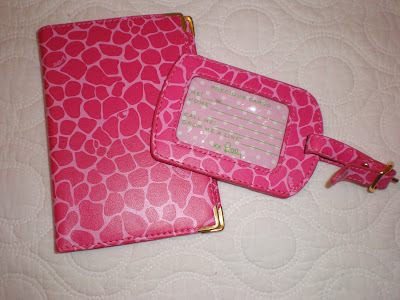 And while I think all things Lilly are essential, God probably doesn't. But somehow she (and her hub....but I am going to go out on a limb here and assume she did the choosing all on her own) knew I would want and love this bag!! B, you are a super-star friend! Even if we will never make it to Broadway, you are a headliner in my book! This is a bit delayed but let's gossip about our favorite (or not) "housewives." First let's chatter about the OC reunion show. E-gads! Vicky is just out of control! She never really owned up to how nasty and mean she was and just continued to be mean and nasty. To think I used to like her! And Tamara....its seemed as if she and Vicky were rather proud of how terribly they behaved. Lady, you have impressionable young children and you are proud of your gross behavior? Ew! Lynn- I did feel bad for her. Everyone minus Gretchen was mean to her. How tacky. I mean, we all chat but to say caddy things to someone's face and then not take ownership over it (ahem, Vicky), is unbelievable. I was going to associate it with toddler behavior but honestly, their behavior is unacceptable at any age! Though, lady needs to wake up regarding her parenting style. Those daughters need a swift kick in the booty. She said that all kids drink and smoke. No, they don't. Jeanna- I know she is everyone's favorite. But I have never really loved her. And this season it is clear why. She is a snake. She is your best friend one minute and spreads gossip about you the next. But pretends she is uninvolved. Really she is a pot stirrer! She causes a fire and then stands to the side claiming to not know what is going on. Vicky and Tamara are mean and nasty but at least they own it. Laurie- I love you. You're my very favorite wife. But please for the love of the hair gods, get a new do. Hair that long on a woman over the age of 25 is just tacky. And again, love and kisses. But speaking of kisses, any chance you might think of scaling back on your botox schedule? You're lips look like they might float off your face. Now to my NY Apples! Ah, my favorite of all three groups! Bethany still has the best one-liners! Girl cracks me up. Jill...I just love her. She's bold and loud and sticks her foot in her mouth but she is so funny. Ramona. It looks like she goes off on Alex and Simon next week. Can. Not. Wait! For as strange as I think Ramona can act, I totally agree that Alex and Simon make my skin crawl. Ugh...and if they are going to complain about everything, why would Alex and Simon even go to the Hamptons? I'm sure the Hamptons would survive if Mr. and Mrs. Skin Crawl just stayed at home speaking French to their children (who incidentally do not speak French). So far I really do not like new girl Kelly. I don't know why exactly but she just seems a bit full of herself. More than the others even. And that's hard to do when you consider Luann was insulted that the pizza people didn't recognize her Countess voice. As Bethany frequently says, "get over yourself!" How (again, love the Bethany one liners!) Dis-Countess was she at "her" Heart Association dinner? Tacky, tacky, tacky! Actually she sort of reminded me of Vicky when she was upset that her mother didn't fawn over her. Puh-leeze! Luann, this is the USA. We don't give a hoot that your hubby (who is never ever in town- anyone else notice that?) is a "French Aristo." I have a feeling this is going to be a fabulous season! So I raise my (pretend) green apple martini to my favorite, neurotic NYC housewives. Cheers! First...Kisses. To y'all! I never ever expected such sweet birthday comments on Sunday. I'm flattered! Y'all are beyond sweet. So I'm sending each of you a kiss on the cheek. And a big best bloggy pal hug. I wasn't in front of my computer at all on Sunday but I was able to see the sweetest b-day wishes pop up on my Pinkberry all day for my blog and Facebook. Kisses, kisses, kisses! Now on to the actual birthday... Well we got a snow storm. But when I left the house it was hardly snowing at all. So I decided to go anyway. Half way there I realized that this was in fact a pretty serious amount of snow. Whatever, I was half way there at that point. I was one of the only people loony enough to be out and about shopping that day- which was great. I love having a store to myself. I didn't win a Jubilee ticket at Lilly (sniff, sniff, boo-hoo!) but I did walk away with a huge bag of fabulous finds. Wanna see what came home with me? I knew you would! I meant to post this yesterday evening but I had two sorority related meetings and didn't get home until....20 minutes to midnight!! Eeks! I do not fair well at such a late hour. First up, Banana Republic Outlet. I usually have luck there and Sunday was no different. 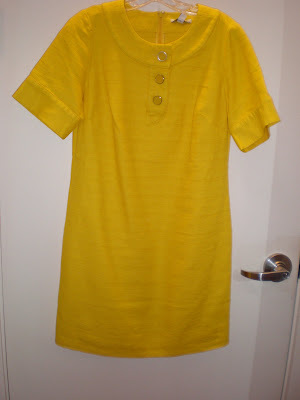 I love LOVE this yellow dress and it looked cute on. But it required that I wear a slip. And I don't like wearing slips. So as much as I loved it and as fabulous as the color was, it stayed in the store for another less slip-phobic customer. 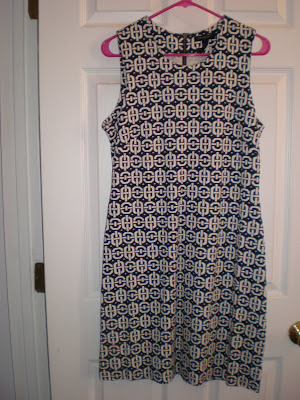 But I did come home with this blue/cream print dress and these black/cream ballet flats. I don't tend to be a navy/black girl but they were both on super sale and very comfortable and flattering. So home they came! Next on to Five Seasons, the Lilly Pulitzer signature shop. It's like eye candy! And everything was on super sale so I made out like a bandit. 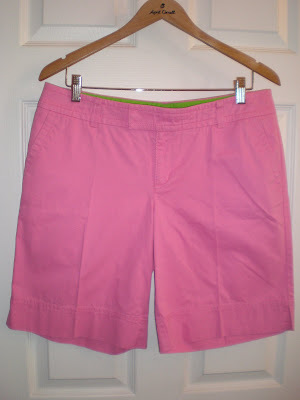 I love these pink shorts. They look humongo in the picture. Maybe I really am that big. Whatever, they are a great color and length. 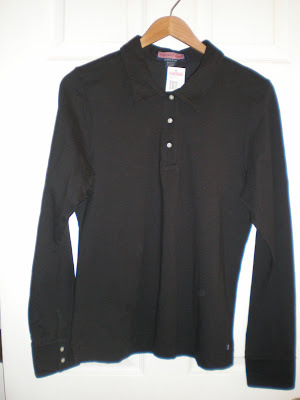 I am a huge fan of Vineyard Vines long sleeve polos and was thrilled to find this one in black at 75% off. Actually, almost everything I bought was either 50% or 75% off. 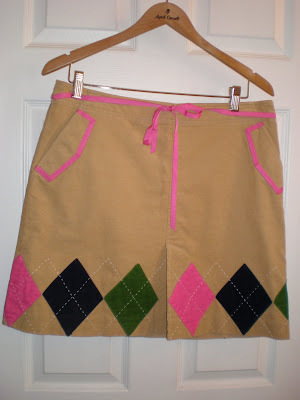 I can't wait for it to warm up a bit so I can wear this skirt with a turtleneck and tights. And yes, I bought yet another Gloria sweater. Hands down my favorite sweater. It's cotton, washes well, fits me well (meaning it's not super short in the body and arms like RL sweaters tend to be) and the colors are fab. 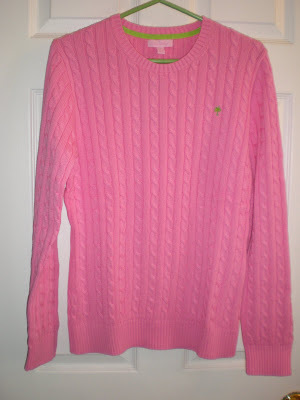 I could do a commercial for this sweater. And I totally own it now in six colors as of this weekend. I'm wearing the cream colored one as I type this. The stationary, which is even more fabulous in person, was the only thing less than 50% off. But the sales gal gave me a LIFETIME coupon for 20% anything full price in the store. She joked that I might laminate it. She should get a good giggle when I next use it, fully laminated! And my favorite purchase was the dress. Before Christmas I bought it in the navy horse print to wear to Christmas Eve. I love it and have worn it many times since. Super comfortable, hides the right areas and highlights others. Are you sensing a pattern here? I fully admit that when I find a piece I love, I buy it in every color. I joke that I only own five items in every color. 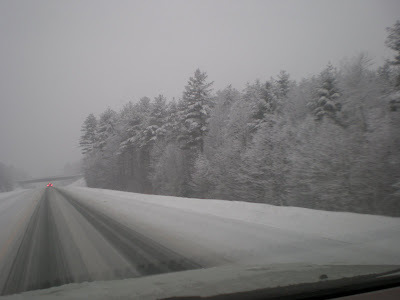 On my way home, it was really snowing. 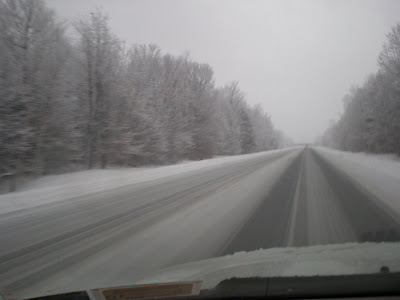 But it was that icky wet snow that gums up on the windshield wipers. Anyone above the Mason Dixon knows what I am talking about. Such a pain. But no fears friends, crappy weather would never keep me out of Lilly and it would never stop me from taking a photograph. Safe, um... well I didn't get into an accident so sure... it was safe enough. This arrived Friday but I waited until Sunday to open it. My free with credits Lilly sweater from RueLaLa! It's different and super soft. 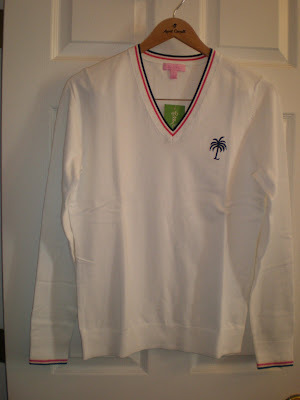 Can't wait for it to warm up a bit so I can wear it! There you go girls. A successful and very preppy shopping spree if I've ever seen one! Again, thank you so so much for the wonderful birthday wishes, emails, calls and FB wall notes! Kisses!! Well, the day is finally here. George Washington, Drew Barrymore and I are all another year older today. I'm not overly thrilled but am trying to keep my chin up. 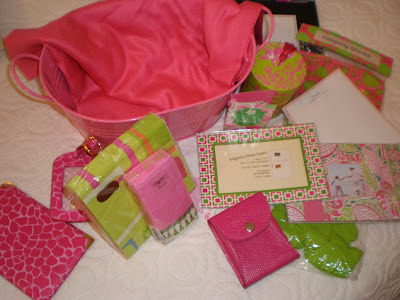 And provided the snow flakes stay away long enough, I am planning a little Happy Birthday To Me, From Me visit to my favorite Lilly store. 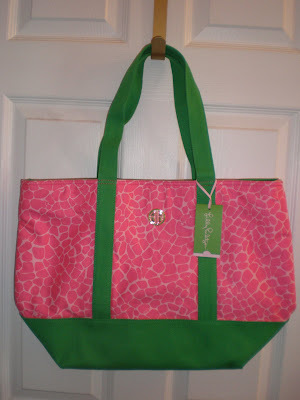 Nothing cheers a girl up like pink, green, and Lilly Pulitzer! Because I am not really a fan of cake, you're just looking at some other fun pink and green party pictures. Cheers! So I just flipped on American Idol. I don't watch this show but I think the group song bit is cute. But I see that every other guy is wearing skin tight jeans. 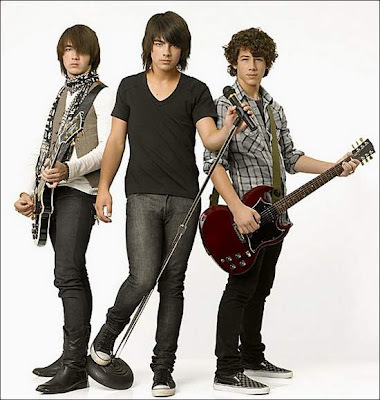 Like the Jonas Brothers. What the heck is with that tight jeans on boys business? I mean, I think there are very few women who can pull it off nicely. So boys, notsomuch. I cannot think of a look less attractive than the I-painted-on-my-pants-this-morning look on a man. Now I'm not saying that the baggy britches with your undies hanging out is any better but a happy medium is perfectly perfect fellas. Khakis. When in doubt wear khakis. Did you know that you can have your kitchen utensils monogrammed at Williams Sonoma? I didn't either but my best pal B (that stands for bench!) and her hub did. This is a very belated post as this is a Christmas gift but who cares? 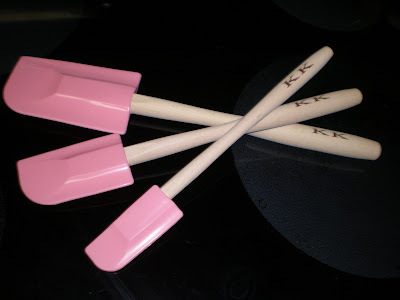 These pink monogrammed spatulas are just as fun today as they were the day I opened them! 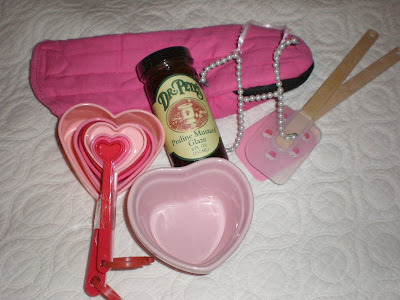 They look like pink perfection when I use them with Petunia (my pink Kitchen Aid stand mixer....yes....I name inanimate objects)! 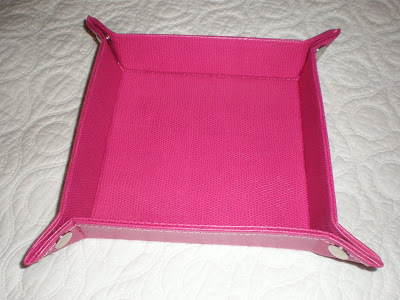 I had no idea they sold these but I think it is a fabulous idea for a gift- Christmas, birthday, wedding or just because. Thanks B and B's Hub! Next to my mixer this is my second favorite holiday gift of '08! How did y'all find out about the Lilly on Martha show? How are these tickets coming about? And how can one little Preppy Pink Crocodile get in on the action? I assume its all too late for me but just for reference, how did this all come to light so that I can be best prepared next time? 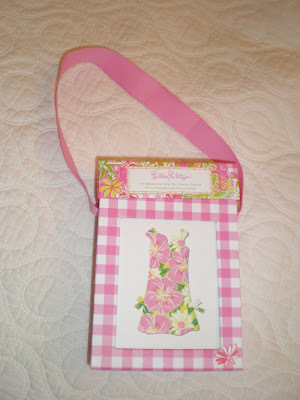 I cannot think of a more fabulously preppy combination than Lilly Pulitzer and Martha Stewart! I so wish I could be there with y'all. I guess I can settle for watching on TV. But if the Lilly P and Martha S peeps are reading this, there are several preppy bloggers, all very dedicated to Lilly and Martha, who would be beyond excited to share in this special experience too. Gosh, y'all are the best bloggy friends a girl can have!! I was in a tizzy last night when I posted about my stern email and feeling like I was this terrible person. But never fear when blog pals are near! You reassured me and made me feel so much better. After a night's sleep, I woke again feeling uneasy but re-read my email for the millionth time and once again, I agree with my actions. It was the right thing to do. But gosh the right thing is not always the easy thing in life, is it?! Pull your big girl britches up, KK!! That's what I keep repeating to myself. So on to more fabulous things... 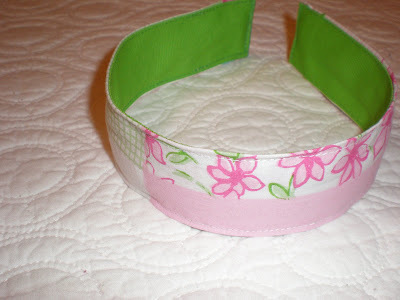 Pink and green-tastic swap pictures! I participated in the PINK swap hosted by the adorable Hopsy and guess who got the golden ticket? Me! I was partnered with that sweet thing! Talk about luck of the draw. 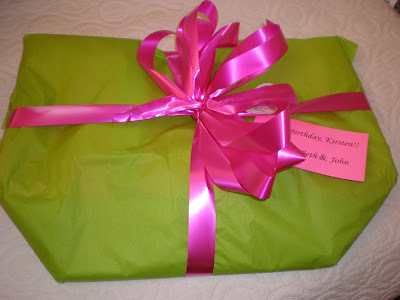 I felt so nervous when I opened her package that I didn't give her equally fabulous prezzies. She truly spoiled me! Just look.... a gorgeous pink pashmina, an adorable sign, cutie kitchen gloves, a yummy gardenia (my favorite flower scent- I know I've never mentioned that on here- it's kismet!) candle, a Lilly scent sample (great minds think alike as I sent her the same one. I forgot she works at a Lilly store- silly me. 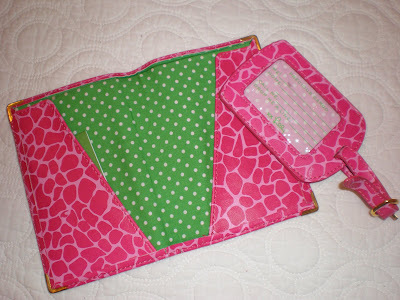 ), Vera photo brag book, pink and green magnetic frame, fantastic pink and green napkins and tissues, playing cards in a pink case and my very favorite gift....a pink Lilly (and green on the inside) passport case and luggage tag!! Hopsy you so outdid yourself. I love LOVE it all!! Thank you thank you thank you!! Not quite as fabulous but hopefully almost as fun, here's some what I sent down to Texas for Hopsy.... (I just realized that I neglected to take picture of everything but she has some photos on her blog so if you are super interested...) A little collapsible box from Pottery Barn, pink kitchen items including my favorite Praline glaze (can be used a dozen ways but it makes a fabulously simple appy if you just pour some over plain cream cheese and serve with apples and crackers), and a few goodies I made out of Lilly fabrics. 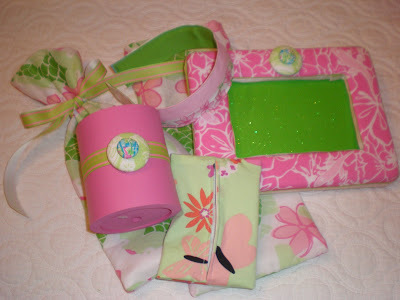 Lilly fabric items include two wine/gift bags (because summer parties in Texas are a heck of a lot closer than summer parties in Upstate NY), a reversible headband, a can coozie (or a marker cup or whatever), a tissue case and a picture frame. The frame was one of those things that I had big plans and high hopes for and in the end I was not super thrilled with it. It just doesn't look as professional and nice as I had imagined it might in my head. 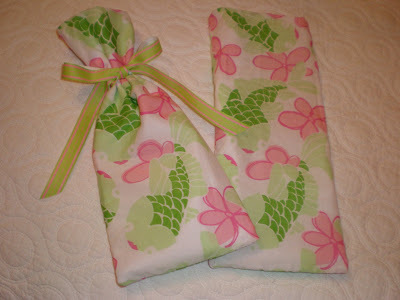 All in all, I think this was a pretty pink-and-green-tastic swap, Miss Hopsy! Thanks a million for hosting. 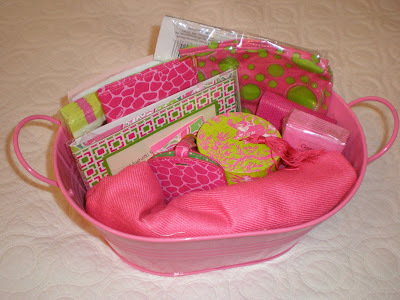 I can't wait to do another fun and cheerful swap soon! Don't forget that the Lilly boutique is happening now at Ruelala! I logged on right when it started at 11AM and lost one of the sweaters in my shopping bag (don't you just hate that?!) by the time I went to check out. I had credits though so the sweater I did end up purchasing was nearly free. Love that!! If for some reason you are not in with the Rue, email me asap and I will send you an invite. There are a lot of cute dresses in the boutique today! I did it! I finally did it, friends!! I joined the 21st century and bought a BlackBerry (or as my father calls it, "a blueberry" or "a raspberry.") I still haven't figure it all out- baby steps for me please. But so far I love it. The best part is that I have reception all over my house and city. I had AT&T before and never had reception. Which sort of defeats the purpose of having a cell phone. But I made a switch-a-roo and now I can "hear you now" all over my house! Oh, and it's pink! When the phone store guy showed me the pink phone he made a big point of telling me it was a subtle pink, nothing too shocking. 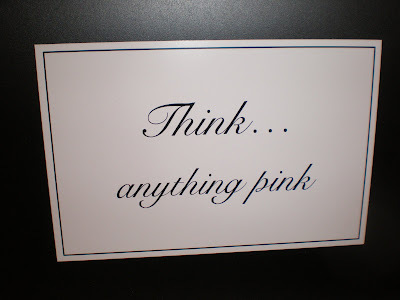 As I was wearing a bright pink scarf and toting a pink bag. Gage your audience buddy! 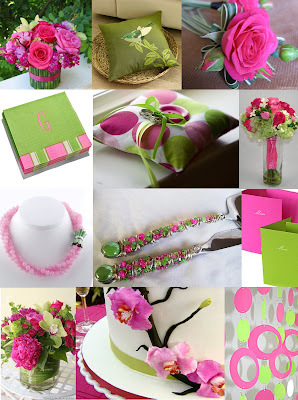 My personal mantra is that one can never go wrong with pink and green! Have y'all ever been to a food bank? Until tonight my answer to that question was a big fatty no. Hard to believe but I just never sought out the opportunity. But at my last Junior League meeting I signed up to volunteer at the Regional Food Bank of Northeastern NY as a DIAD project tonight. Y'all, it was such a fantastic experience! First of all, the place was immaculate. I expected it to be dirty and chaotic. And it was a lot of fun. A great activity for a family too. There was a little boy there (I'm guessing maybe age six or seven) with his parents helping out. I also expected to be lifting (so not my strong point in life. I have the wimpiest arms ever.) dirty cans and sorting out boxes of dented pasta. I'm sure there is plenty of that to do at other times. But tonight we started out sorting through boxes of make-up. I think it was donated by a large drug store chain. Some things were dented or torn but almost all of it was in perfect condition. Just older packaging or a brand that they no longer sell or an item that didn't sell well or whatever. All name brands like Maybeline. Just because women are in a down turn, doesn't mean they can't feel pretty. You can't job hunt if you don't present yourself nice. And you need to feel confident too. It astounded me at the amount of stuff though. Thousands of tubes of lipstick, mascara, concealer, nail polish, and hair brushes and much much more. Boxes upon boxes of items that would otherwise be trash. After we finished sorting make-up (we put together boxes so that each box had a semi-even variety of items), we did the same thing with over the counter medicines. This was a novel idea to me. I am ashamed to say I never before thought about the fact that if a person is deciding between winter boots or Advil, the boots or rent or food will always win out. It's not that I am so dumb that it doesn't make perfect sense, but I just never thought about that particular detail before tonight. Sorting medicine was a lot more tedious. We had to open the packages to make sure they seals were still on and the items were not expiring soon. But there was A LOT of humor in this too. We were directed to throw out items such as anything related to birth control or feminine cleaning. I asked why and was told that people need to know that those items are 100% reliable and we would not be able to guarantee that. So you know when you open up a new box, of course there will be a dozen open boxes of pregnancy tests and um...."feminine cleaning" products! :) The funniest part was reading the return slips that were taped to may of the boxes and bottles of medicine. I should have written them down as I now only remember a few but trust me, they had us giggling a lot tonight. I am so going to do this again. I really enjoyed myself and it opened my eyes in many ways. If you are like me and have never volunteered at a food bank, give it a try. So easy and fun and a great way to contribute to your community!